← Jabba's Sail Barge HasLab Update #5: The FINAL Update! Entertainment Earth Processing TVC Rey (Island Journey) Orders! 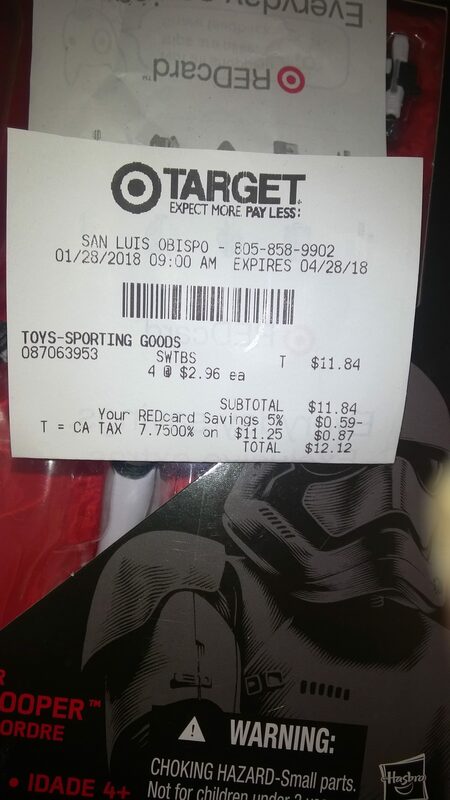 If you gave up on finding the TVC Rey (Island Journey) Walmart exclusive figure at Walmart when Hasbro said it was “shipped” in May, we have good news. Entertainment Earth is beginning to process orders online. Could you possibly receive her before Christmas now? Special thanks to Rum Sleg and Craig F. for the order updates! Well, we’re a bit speechless at the moment. But JTA reader Jared S. reached out to Hasbro Design Director Steve Evans in Instagram to ask him where in the world the Walmart exclusive Rey (Island Journey) figure is. Steve wrote back and told him the figure hit shelves a month or so ago! So far, JTA has only received reports of this figure hitting Canada (and only sporadically). Not ONE USA store report has come into us nor has the figure gone up for sale at Walmart’s online store if that means anything to you. Hasbro, please consider using Walmart as little as possible for the future please? We’re sure you got them the figures in time, but they’re probably sitting on them in their warehouses. What do you think folks? Will Rey (Island Journey) make her debut at ROSS or TJ Maxx in time for Christmas? ← Star Wars Toys Performed Well After All! Where in the heck is the Walmart exclusive The Vintage Collection Rey (Island Journey) (VC122) figure? It should have been out since June (Hasbro’s SDCC presentation confirmed this too), and aside from a couple of eBay auctions, there aren’t any USA store reports and anything offering a glimmer of hope to collectors that the figure is forthcoming. We also reviewed our sample in early May. Our sources have assured us that the figure is right around the corner, but why has this exclusive not arrived on time? You REALLY have to question how screwed up distribution is, or there is something very, very wrong at the warehouse level at Walmart. However, you can whet your appetite on this great figure in our Research Droids Reviews until this figure makes it to Walmart. We have another The Vintage Collection Visual Guide update tonight, this time featuring the Walmart exclusive Rey (Island Journey) (VC122). Click below to check out our full guide page. If you didn’t catch our review of this figure posted earlier today, click here to have a look! The Rey (Island Journey) (VC122) Walmart exclusive figure is PERFECT except for one major thing. Find out what it is in our Research Droids Reviews today! Be sure to leave your thoughts in our comments section, vote in the poll or even comment about it on our Facebook page. Click the banner below for the direct link to the review! As always, you can also send your review requests via email if you’d like to see something that we didn’t cover yet. Sneak Peek! The Vintage Collection's Rey (Island Journey) (VC122) Walmart Ex. We have a sneak peek for you for The Vintage Collection’s Rey (Island Journey) (VC122) Walmart exclusive figure. On paper, this figure is a collectors dream come true. She’s loaded with 28 points of articulation including a premium reverse ball-socket neck and ball-socket head combination for optimal head movement. The soft-goods are tailored beautifully, and the sculpt of the figure is stunning. As you’d expect, the figure is ruined thanks to “TBS paint operations on a TVC figure.” Hasbro MUST figure out how to optimize the facial deco on these gorgeously sculpted 3.75″ super-articulated action figures. Rey (Island Journey) is a perfect 10 were it not for her disappointing and sloppily applied paint job. Check it out in our RDRs now. The review is coming tomorrow. DJ (Canto Bight) And Rey (Island Journey) IN STOCK + 20% Off! If you’re interested, both DJ (Canto Bight) and Rey (Island Journey) from The Black Series [Phase III] 6″ are IN STOCK. What’s more, use promo code MAD4MARCH to get 20% off your order and FREE shipping. Special thanks to all who wrote in to let us know about this promotion! Some new images have surfaced of The Black Series [Phase III] 6″ Rey (Island Journey) in case you haven’t seen them yet. Special thanks to rivesjunctionite for the heads up! Found! TBS6 [P3] DJ, Rey (Island Journey) And Captain Rex In Canada! Found! 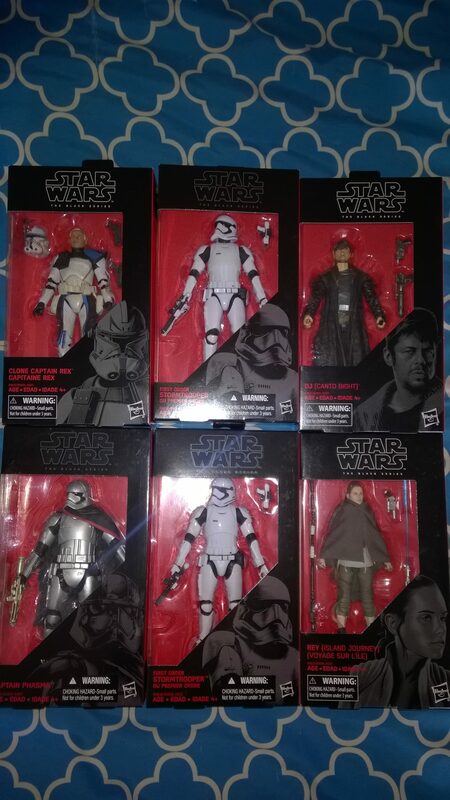 The latest wave of The Black Series [Phase III] figures has been found in Canada! JTA reader Argyris A. sends us some quick pics to share with the rest of our readers. The “photo realistic” technology came out better than expected. We thank him for sending these pictures along! Check out our Visual Guide for the newly released Rey (Island Journey) from the latest Star Wars [The Last Jedi] wave. Click below for the full guide page, and read our full review here. Sigh. It’s another action figure based on Rey. Rey (Island Journey) isn’t exciting, but perhaps she’s a necessary release. See what you think in our Research Droids Reviews today! Be sure to leave your own thoughts in our comments section, vote in the poll or even leave comments about it on our Facebook page. Click the banner below for the direct link to the review! As always, you can also send your own personal review requests via email if you’d like to see something that we didn’t cover yet. ← Huge Sale On Everything At TFAW! We have a sneak peek for you of the newest wave of Force Link basic figure before we begin the reviews tomorrow! Check out galleries and collector notes for these figures now. DJ (Canto Bight) is a nice figure, but it doesn’t look much like Benicio Del Toro at all. He comes with an all-new and very cool blaster that looks like something from the Old West. R2-D2 is the star of the wave for us. Hasbro resurrected the Build A Droid sculpt for this figure and we couldn’t be more elated about it. Luke Skywalker (Jedi Exile) looks much better without his hood but comes with two extra points of articulation: swivel wrists. 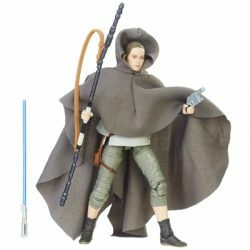 And Rey (Island Journey) is really just a reason for Hasbro to double dip on a version of this character we already have, but this all-new sculpt does come with swivel elbows this time around. Click any of the images below to be taken to our Research Droids Reviews on this wave of figures. General Leia Organa and Jyn Erso (Jedha) will be forthcoming.